The early 90s was a bad time for vinyl. It was probably the worse time. Vinyl was forgotten. Cassette hung in there, but it was all about the CD. Many of the biggest albums of the era never saw a vinyl release. Lots have been reissued, but finding an album from the 90s is a pretty good find. And as I said in my last post, my day at Glebe Record Fair descended into a 90s day. R.E.M.‘s Out Of Time is, of course, one of those biggest albums of the 90s. 18 million copies! That’s a crazy figure. It propelled the most beloved indie band in America to one of the biggest rock bands in the world. For many, R.E.M. would never be the same, or ever as good. Not for me, as I think a lot of their best work is still to come. So here’s the thing I want to say about Out Of Time. It’s actually a bit of a weird record isn’t it? I think of it as one of the weakest R.E.M. albums. Second album into their Warner deal, it feels like they had no idea what they were doing, and they were trying everything. It opens with a rap song featuring KRS-One. “Shiny Happy People” has three singers. There’s an instrumental. A total of 22 people play on the record. No two songs sound the same. Sometimes that can be ok, a bit of diversity. But R.E.M.‘s best work is when the four diverse heads come together. Their best albums are of a single piece (the murky power pop of Murmur, the mortal folk of Automatic For The People, the cold electronics of Up, the fiery straight rock of Document and Accelerate). Their weakest are when they try to do too much in one go (Around the Sun, Reveal). Some of their best songs are on this record. “Losing My Religion“, a song that will live on after R.E.M. are forgotten (in a few centuries time). “Country Feedback“, a fan favourite that is a live staple. “Near Wild Heaven“, “Low“, and more. There is just something really scattered and unfocused about the record. And even I’ve grown tired of “Shiny Happy People“. My point is this. 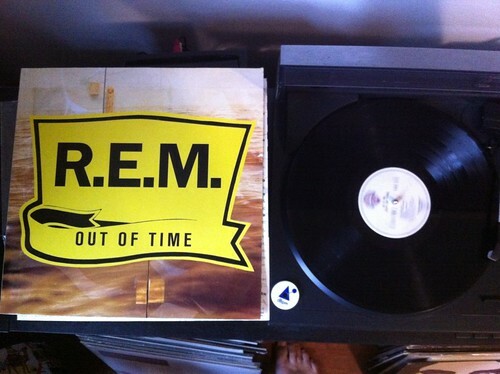 Out Of Time is the album that made R.E.M. into stars. And for every record after that, they tried to match it. Out Of Time became the one to beat. And it really shouldn’t have been. It obscured the rest of their career, and it’s a shame. I’m still happy to own this album. R.E.M.‘s 90s vinyl is still rare. The 80s stuff has been reissued now. Last years celebration of 1991 missed out on this album, but one day these guys will look back and I will probably see this on record everywhere.